Hi-Gain 3-Way Headband Microphone (electret) - Versatile uni-directional mic offers even better pick-up than the previous version for very weak, breathy or wispy voices. Mounted on a thin, flexible spring steel headband - can be bent slightly to adjust tension/pressure on the head. The adjustable stem holds the mic firmly in the postion you choose. Can be worn 3 ways as illustrated - around the back of the head, over the top of the head and around the neck.. Fits adult size head but can be adjusted here before shipping for small or child size heads. If the head measures less that is less than 16½" from the outside corner of one eye around the back of the head to the outside corner of the other eye, give us that measurement when ordering. Mounted on a spring steel headband. Weighs 1.5 oz. Cord 43 in. long. Uni-directional mic. (Replacing the previous ChatterVox headset mic - this new mic is much more sturdy and stable). The mic is on the end of an adjustable stem that will hold its position. Mic attaches on the right side only. The headband fits adult size heads and is NOT adjustable for head size. Weighs 1.5oz. Cord 45in.long. Unidirectional mic on a bendable gooseneck that wraps easily around the neck and allows you to bend the mic element up to the side of the mouth on either right or left. Best positioned as shown - up at lip level but well to the side so that you talk across the face of the mic. Note that his mic does NOT move when the head turns, so you can easily turn your head away from it to cough, clear your throat, eat or drink - but you must remember to turn your head to the proper positon when speaking. Also, if you are active, you will need to pin the mic under your collar to avoid it bouncing around. Weighs 3.5oz. Cord 36" ft. long. Weighs 2.25 oz. 4.75" long, 1/2" in diameter, cord 48" long. Excellent Anti-Feedback Characterics This medium-light tan flesh-tone mic weighs only ½ oz. and has supports that hook around both ears to keep the microphone very steady just where it needs to be - at the corner of the mouth very close to the lips for maximum output. Compared to "stage mics" that are similar in appearance, the Super-Lite Headband Mic is much less expensive but should provide much better performance for people with weak voices. 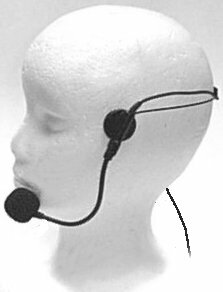 "Stage mics" are omni-directional - made to pick up surrounding sound as well as the user’s voice, but the S-L Headband Mic is a noise-cancelling microphone which does an excellent job of avoiding feedback and picking up the user’s voice but not the sounds from others talking, TV sets, etc. Also the Super-Lite Headband Mic has a narrower frequency response when compared to other similar looking microphones so it is not as likely to pick up a lot of hissy air noises when used by someone with a whisper or whispy voice. The mic boom is very thin and easily adjustable in length to bring the microphone to the proper position. It can be adjusted to a comfortable fit for long periods of time. The right-angled 1/8" monaural plug is less vulnerable to damage than a plug that stands straight up. The 42" cord is thin and light weight and can easily be tucked into or under clothing, but it is easier to damage the cord if it is caught in doors or drawers or handled too roughly than it is with a heavier cord, so we would say that the mic cord must be handled with a little greater care than our other mic’s cords and will not take much abuse. 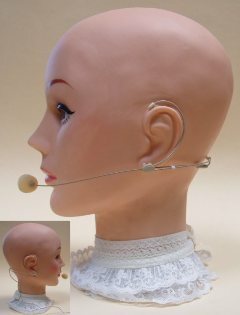 This wonderfully light weight mic can be adjusted for comfortable fit for long periods of time, but it requires a little more fitting and adjusting than our Hi-Gain 3-Way Headband Mic and other mics and is most suitable for use by one person rather than for constant readjusting to pass from one user to another. And it is not easily adjustable to very large or very small heads. All in all, the Super-Lite Headband Mic will not provide quite the level of amplification that the Hi-Gain 3-Way Headband Mic does and will not be as easily and quickly adjustable, it will do a great job for many people - especially those who want to wear an amplifier at chest level or whose positioning difficulties mean that it is difficult to separate the microphone very far from the speaker.